ASUS introduced the industry’s first 4K HDR gaming display with a 144 Hz refresh rate using a quantum dot film at CES. The ROG Swift PG27UQ will be a new dream gaming monitor from the company because it features all the modern display technologies and a very fast refresh rate. Since the product is not set to hit the market immediately, ASUS decided to stay quiet about its price and availability timeframe, though expect it to be around $1500-$2000. 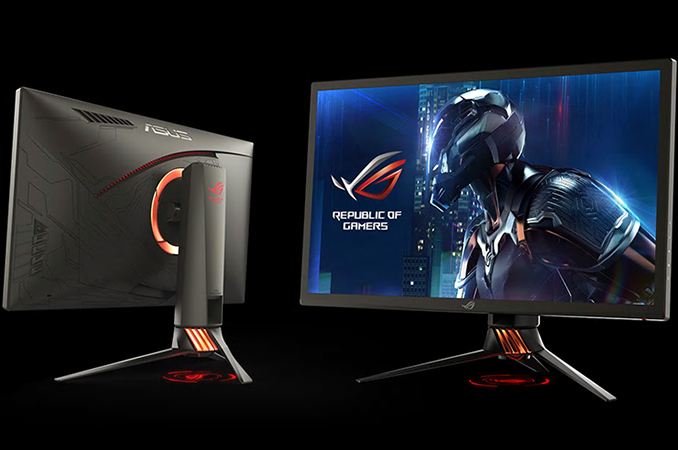 The ASUS ROG Swift PG27UQ is based on AU Optronics’ AHVA panel with a 4K (3840×2160) resolution, up to 1000 nits brightness, and a 144 Hz refresh rate with G-Sync. The manufacturer gave the panel a quantum dot treatment via a 3M film in early samples, but as of yet we do not know the exact color gamuts support as these have not been announced yet. ASUS has stated that the panel will offer support for HDR10, which means it might end up offering settings HDR-related color spaces, but at this time it is unconfirmed. Additionally, the monitor is equipped with NVIDIA’s G-Sync HDR variable refresh rate technology for smooth gameplay. Finally, the PG27UQ received a new direct LED backlighting with 384 zones that enables the high brighness and should lend itself to better contrast ratios (this enables localized dimming as a result). In the recent years, monitors tailored for gamers have gotten increasingly popular because they offered key features important for the target audience: a large diagonal, high PPI, a very high refresh rate and a variable refresh rate technology. Meanwhile, to enable all of the aforementioned, manufacturers had to make certain design tradeoffs when it comes to resolution, brightness and at times even viewing angles due to panel selection, which may have compromised other types of experiences. The new ROG Swift PG27UQ packs everything that ASUS had to offer when it comes to gaming and multimedia, enabling users to have premium experience across the board. The novelty is not absolutely tradeoff-free, though: the display is smaller than the ROG Swift PG348Q. To take advantage of all the features that the ASUS ROG Swift PG27UQ has to offer, owners will have to use an NVIDIA GeForce GTX 10-series graphics card with a DisplayPort 1.4 connector that supports 4K/144 output (albeit, with DSC) and HDR. NVIDIA’s previous-gen GeForce GTX 9-series GPUs have an HDR-supporting HDMI 2.0a display controller, but the HDMI port on this panel is only good up to 60 Hz at 4K. While we do not know when ASUS intends to mass-produce the ROG Swift PG27UQ, it is highly unlikely that this is going to happen shortly for several reasons. Firstly, ASUS and AU Optronics demonstrated the prototype of the panel that powers the display at Computex 2016 and so far, we have not seen any indications that AUO has started mass production of its 4K/144Hz panels. Secondly, contemporary high-end graphics cards barely deliver 60 fps at 4K in games - without sufficient grunt, the monitor will simply not use all of its potential in high-end titles, which could affect demand. On the price side, keep in mind that the Swift PG348Q will remain the flagship ASUS ROG display and therefore the new PG27UQ will unlikely cost more than its bigger curved brother does. We've heard murmurs around the $1500-$2000 price point, but we will see. Given the timescale of a device like this, I suspect we will have more information around Computex time (early June). Damn. Well done Asus! Even in IPS flavor! Finally a justification to SLI Titan X-Ps! Or maybe 4... Heh. 1) Freesync instead of proprietary sync. Would be perfect for Freesync 2 in fact given the HDR support. 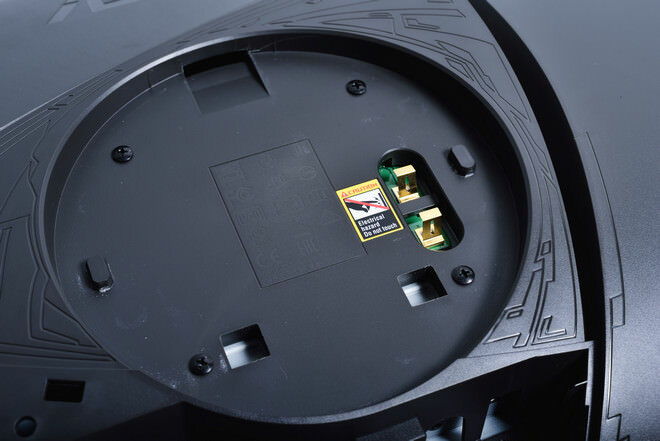 I believe the monitor does have VESA mounting screw holes underneath the ROG "eye" design on the back of the monitor. You have unlatch and detach the existing monitor mount to view the VESA mounting holes. This happens to be a quickest link that I can demonstrate it, but it's at a Taiwanese review site for the Asus ROG PG348Q monitor. Considering 95% of the high end is all Nvidia (at least the people this $1500-2000 monitor is aimed at), having freesync would limit your sales since it won't work with any of these people.